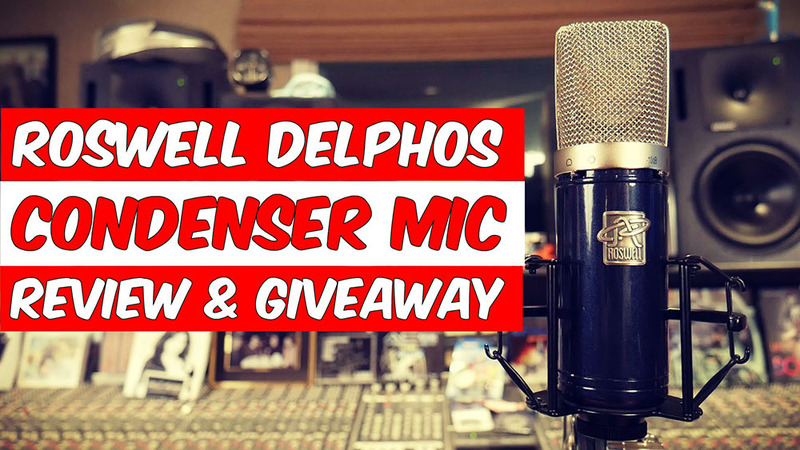 Today we’re reviewing the Roswell Delphos Condenser Microphone. I’m reviewing this mic because after the other reviews we’ve done with Roswell, and the Q&A’s we’ve done with the lovely Matt McGlynn, loads of people starting asking me about this mic! I use this mic on everything! It was late and I wrote and recorded this short song in around 40 minutes. I used the Delphos on every instrument, Drums, Bass, Electric and Acoustic Guitar, Piano and of course vocals. I had heard from several people that it made a wonderful Electric guitar mic and it does. Overall, it’s warm, there is clarity in the high end with no harshness, making it a very versatile mic, even with a little high end boost on the vocal and acoustic guitar, it still sounded very smooth. One of the things I like about this mic is that it comes with a quality test certificate with a date and signature of the tester. Make sure to enter the giveaway below for a chance to win this marvellous mic! The Delphos® is a premium studio condenser microphone, featuring unhyped and natural frequency response, very high sensitivity, and very low self-noise. The microphone uses a highly optimized transformerless circuit, which provides a pristine signal path. The microphone’s circuit boards are manufactured and populated in the US, using the finest components sourced from around the world, including low-noise NOS transistors and imported European capacitors. Two switches located on the front of the microphone provide pattern control (Omni / True Cardioid) and pad (-10dB). Each Delphos is built in California, hand-tuned, “burned in,” and extensively tested after manufacturing to ensure the best possible performance.